The stem of this pipe is wrapped with deerskin leather in your choice of colors (shown in gold buckskin) and has two rabbit fur wraps. 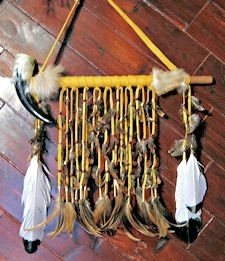 It also has many long fringes with dozens of colorful feathers held on with brass trade beads and glass crow beads (shown with Ringneck Pheasant and orange neck hackle small feathers and Imitation Eagle big feathers). If you have a preference for bead colors, leave a comment in the comment box on your checkout form. We usually have all the colors shown on our Crow Beads pages. You also can choose your feather choices from the dropdown menu below. Choose one choice from the Feathers menu and one choice from the Large Feathers menu. This product was added to our catalog on 01/09/2012.